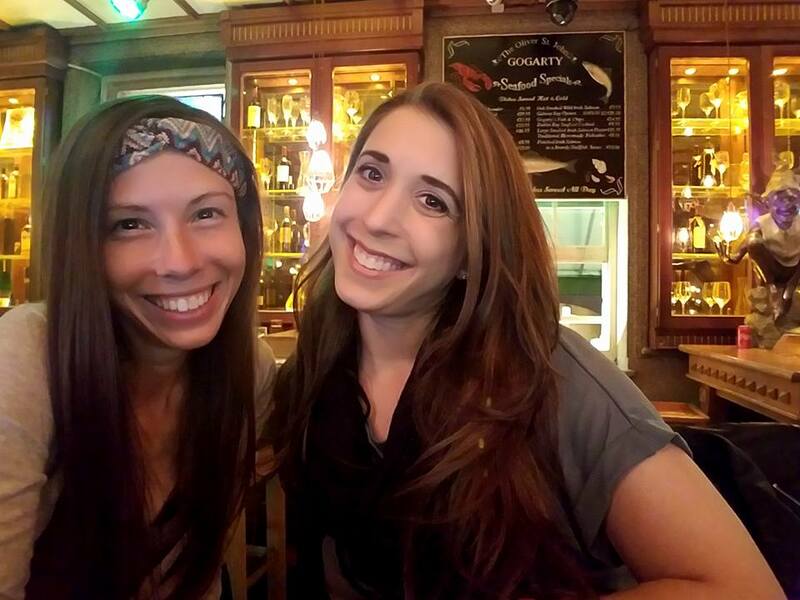 Along with my travel-bug-bitten cousin, Brittany, we mapped out a European escapade that would have us spending almost three days in France, a little over three days in Ireland, and three days in England. Now that I’m back in the States, it’s time to break it down. Norwegian has super cheap flights to France right now, FYI. We flew Norwegian into Charles de Gaulle Airport and made our three-train trek to our hotel, Novotel, in Versailles. We got some decent rates there and the place is clean and serves delicious cappuccinos. It’s also in a walkable, urban-like location near restaurants, shops, and bakeries with fresh French bread (important!). We visited the Palace of Versailles, which seems to be the main attraction around there if you don’t want to eat and shop all day. While the Palace of Versailles was decked out in history and gold, the hour-and-a-half wait in line to get in wasn’t worth it, at least in my opinion. Perhaps I would have appreciated it more if I brushed up on my French history, but for the most part, the museum seemed average. 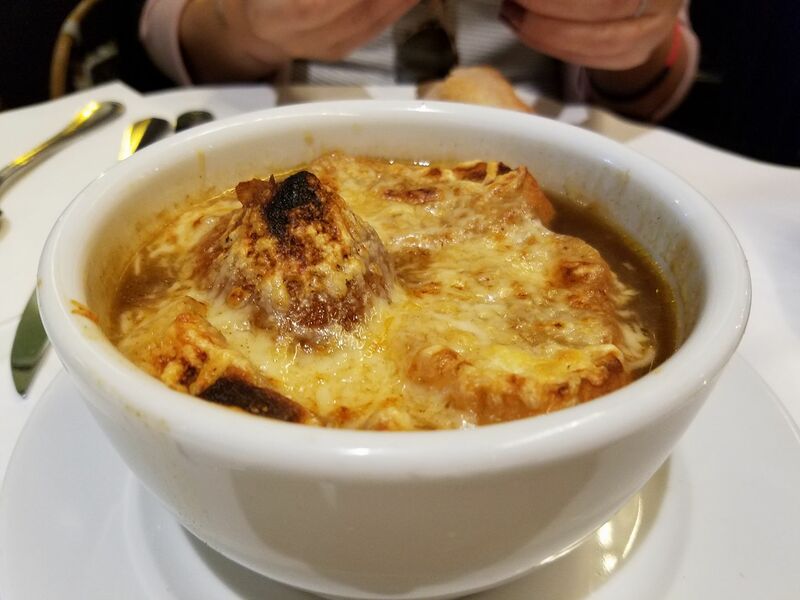 The French onion soup served in the Palace’s restaurant, however, was delicious. 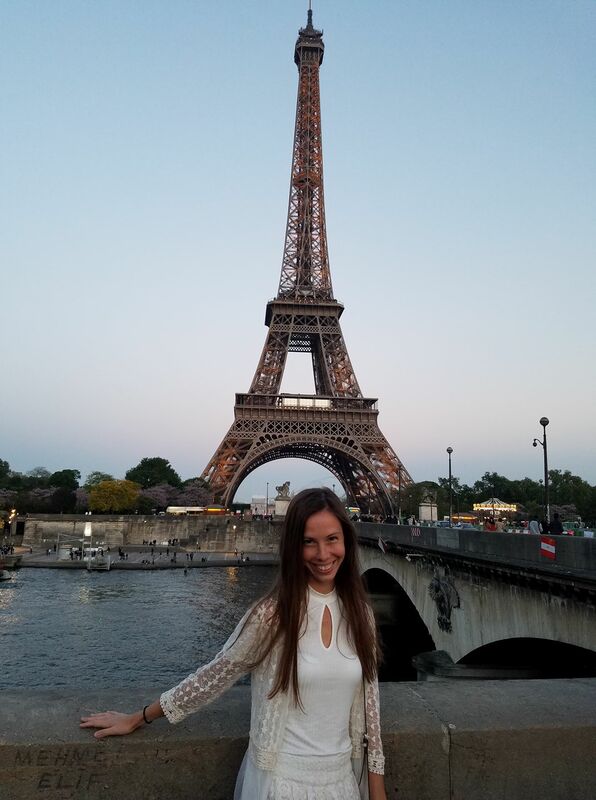 Once Britt and I got to Paris, we took model-wanna-be Eiffel Tower pictures (and avoided pushy French men wanting us to drink their champagne). After workin’ it and workin’ up an appetite, we went for dinner and weren’t impressed. We weren’t complaining, and the food was decent, but as a food capital (in my mind), I was expecting more out of Parisian food. To be fair, besides for French onion soup, I didn’t go for anything traditionally French. I had salmon and vegetables one night, and a chicken dish the other time. Both were good, but that was about it. I thought about escargot, but would be the only one eating it, and really just wanted a taste. Because I don’t like wasting food, I didn’t go for it. However, dessert is where it’s at in Paris! If you have a sweet tooth, Paris is worth a visit. 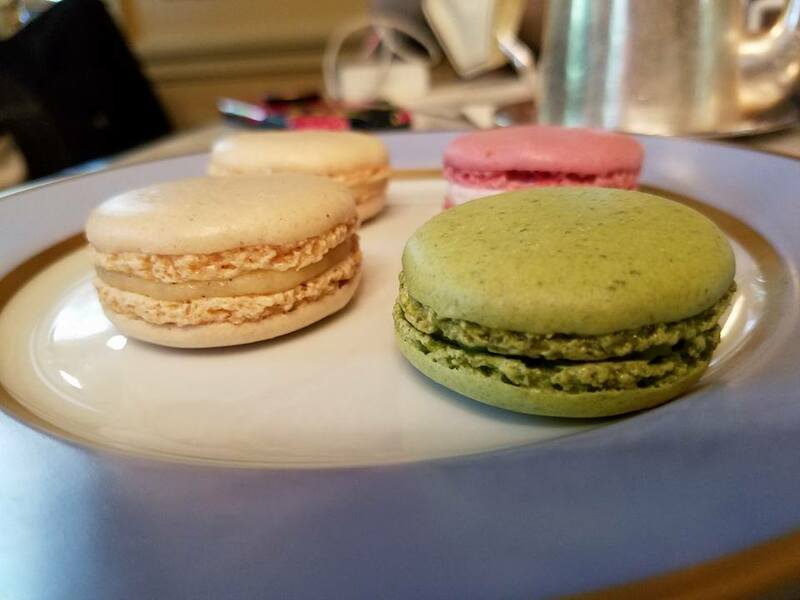 The macarons are beyond delicious and Ladurée has every flavor imaginable, along with cakes and other fresh desserts waiting to make your taste buds swoon. We went there twice and knocked ourselves into sugar comas. Ladurée offers an elegant and adorable environment and is probably that cute little lovely French spot to go on a nice date at (food and tea is served there, too). 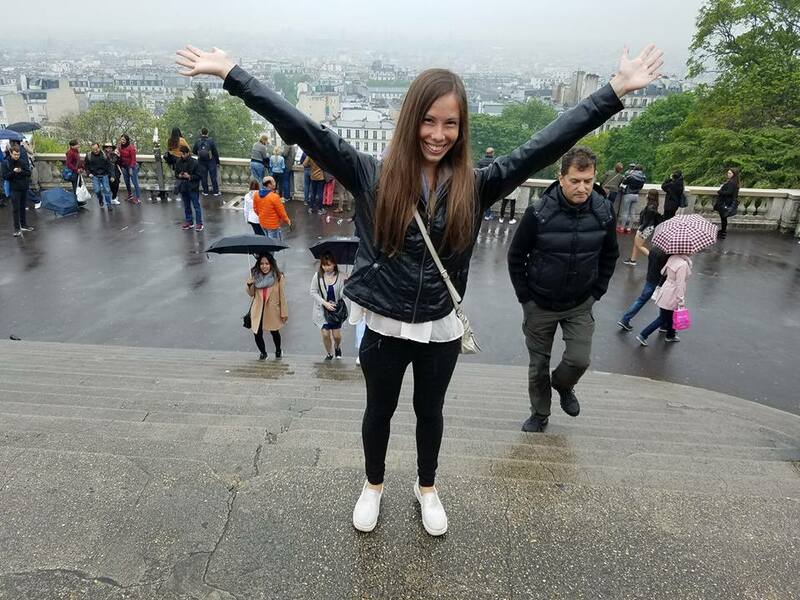 Although I’ve read the area has become so touristy, Montmartre in Paris is gorgeous and was my favorite place for scenery. You can catch a nice view of the city from the steps behind the Basilica of the Sacred Heart of Paris. I’ll start off by saying this place has my heart, Dublin in particular. And someone must have plucked a four-leaf clover, because we were blessed with great weather (France was rainy). Unlike the people in France, who I found keep to themselves for the most part, Irish folks are happy to stroll right up to you and start a conversation, and don’t mind you hanging around either. The people here are down-to-Earth, funny, respectful, and also drunk, yes, it’s true. The Irish know how to down their Guinness, that’s for sure. I also found that in Dublin, places you’d expect to open early, like a coffee shop, open later than in most places in the U.S. For example, Britt and I had a Cliffs of Moher tour lined up early one morning. You’d think coffee shops would be open at 6:00 a.m. Nope, not for the Irish! They party hard, and that’s okay. They’re fun to dance with. 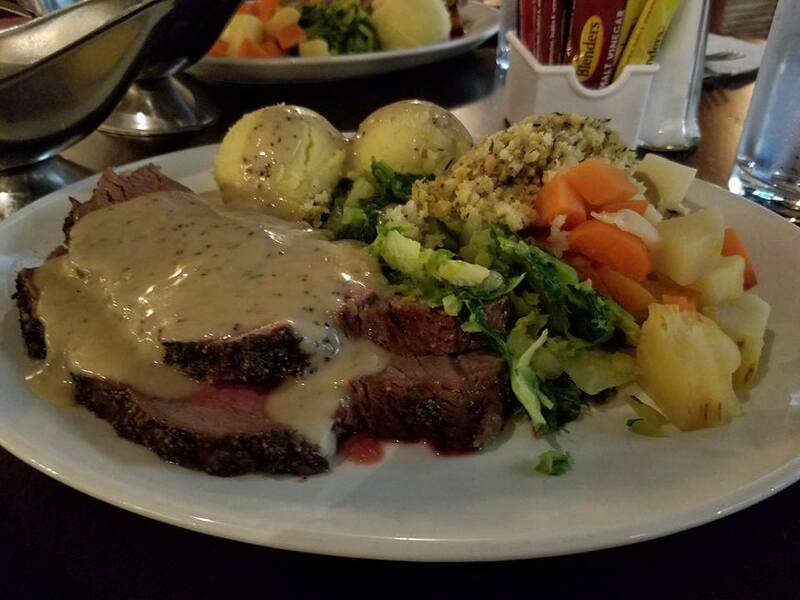 Surprisingly, I found the food in Ireland to be the best of our adventure. It was tasty and fresh, and although I can be picky with red meat, I could not stop eating this stuff. I tried Irish stew, corned beef and cabbage, shepherd’s pie, fish and chips, and at one point we went to Sinnots for their meat carving (recommended by a local bartender, Connor, at Temple Bar), and the roast there was incredibly satisfying, along with plops of mashed potatoes, vegetable mountains, and cabbage with attitude. So filling and so good. Both Britt and I agreed that Gallagher’s Boxty House was the best restaurant. Located right near our hotel, Blooms Hotel (which is awesome and in a fantastic location in Temple Bar), it opened up a whole new world. In case you don’t know, a boxty is an Irish potato pancake. And they wrap this potato pancake around meat or veggies or whatever you prefer. We went there for dinner twice in a row. Yes. It was that good, lads and lassies. That good. The luck of the Irish was on our side. 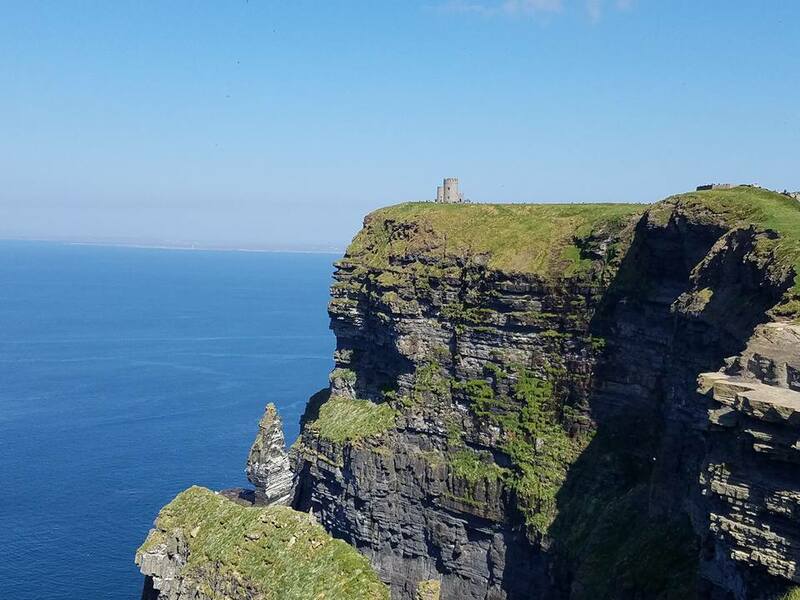 My favorite part of Ireland was adventuring along the Cliffs of Moher. 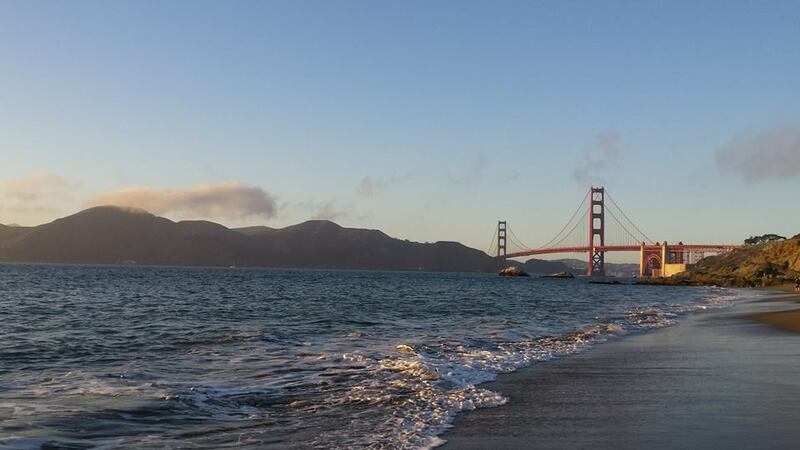 There are no words in the English language to describe the beauty of this place. I felt so connected with the Earth here. It was clean and majestic and pure. Of course I had to hang my feet over a cliff, so that was a cool adrenaline rush. It took about three hours to get to the Cliffs on our tour bus from Dublin, and we also stopped in Doolin (super green with cows and sheep!) and Galway (pretty riverside city with tasty Irish gelato). As you’d expect, all that trekking made us thirsty, so we found ourselves wandering to the Guinness Storehouse for a beer the following day. We treated ourselves to some of the freshest dark beer in the world and it was smooth, crisp, and refreshing, and to top it off, the highest point within the Guinness Storehouse has a pretty view of the city. Overall, Ireland was my number one. I would go back — we needed more time there, honestly. And one small thing: when asking for directions in Dublin, nothing is “just around the corner.” For some reason, Maps did not like Dublin much (or maybe it had too much to drink). Made for some entertaining travels. Bloody hell, England, you fine bloke! We stayed in the Park International Hotel in London and were very happy with the service and cleanliness there. And the location, of course, right in the middle of some English action — close to restaurants, shops, and the Tube. 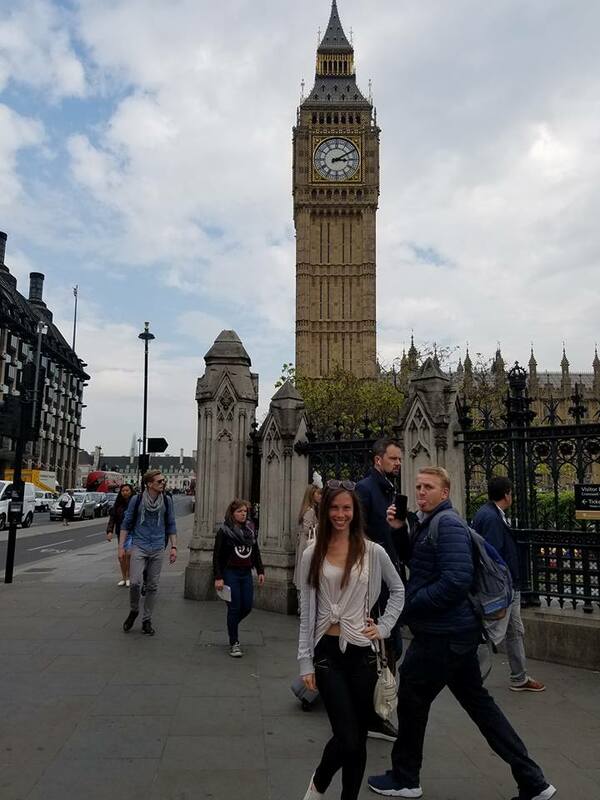 Upon arrival, we spotted Big Ben right away, towering over the city and looking fierce, and snapped some pictures. I got photo-bombed while posing with Ben, and while I was standing in front of the London Eye. Them Brits be cheeky ones. I found the English to be friendly and talkative, and Britt and I ate and drank with a few of them we met during our travels. Friendly fellows. Of course accent jokes and imitations flew around. We did the typical touristy stuff. We saw the London Bridge, went to the Buckingham Palace, snapped posing-inside-the-phone-booth pictures, and got super fancy and blew some pounds on tea at the Ritz. It was a ritzy experience and we just had to. The service there was divine and the tea and finger sandwiches were simply delightful, darling. As far as food goes, the fish and chips is pretty darn tasty in London, but the Indian food is where it’s at! That samosa chaat was the best I’ve had. Cinnamon Bazaar is the name of the delicious Indian restaurant, if you’re curious. 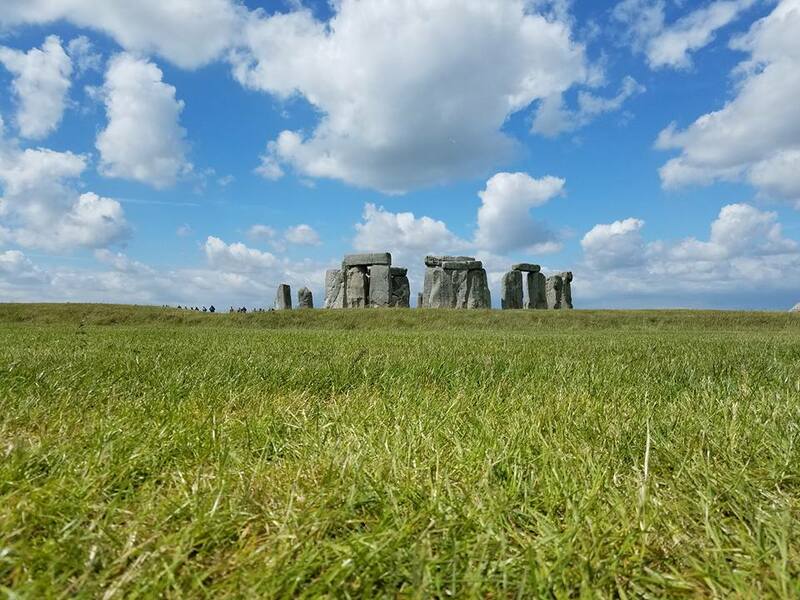 Samosa chaat aside, my favorite part about England was hopping on a bus to Stonehenge. Seeing that ancient structure up close and personal and not on the History Channel was breath-taking. Sometimes I like to believe aliens arranged these giant rocks, but our tour guide said she believes the structure was created to track the sun for farming purposes. Other people believe it to be for religious reasons. Whatever the real reason, aliens included, it was epic. We also visited Windsor Castle and Bath on our tour. Of course, out of excitement for a photo op, I dropped my phone in the Roman waters of Bath. You know, the old dirty water you’re not supposed to touch. As a rebel at heart (no, I just had to save my communication device), I slammed my arm in there to grab my phone, and confirmed the Samsung Galaxy S7 is in fact water-proof. I have yet to become seriously, seriously ill.
Before we knew it, we were on our flight aboard a TAP Portugal jet (surprisingly good airline food alert!) back to the States. We had a two hour layover in Lisbon, Portugal, and it gave me ideas. Somewhere out there, another adventure awaits! A joy to read about your European expedition and loved the model pics in France. Photo bomb in England is classic. Glad to see you enjoying yourself and testing your limits but then, as I remember, you always did. Stay well and keep testing those boundaries.